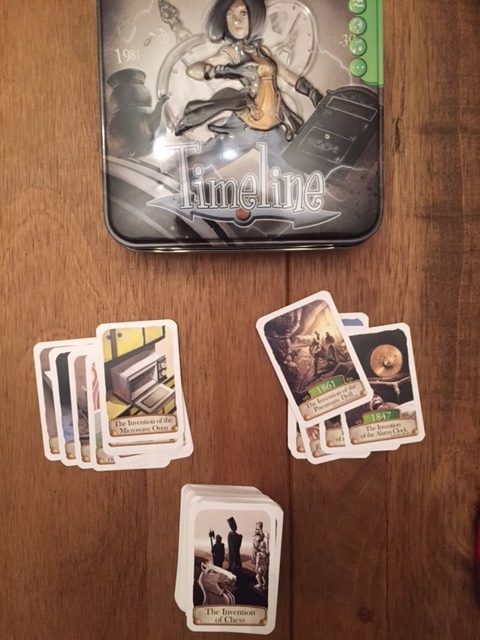 Following on from our review of Dobble, another quick yet fun game you could enjoy over the festive period is Timeline. Prepare to mock people over their lack of knowledge with regards to major and minor historical events. Timeline along with Dobble is another game we were lucky enough to play a short round of at EGX 2015. While it was only a very short game, it did stand out to me as another type of game I could see playing with friends and family at many occasions. There are various different sets of timeline you can play, and you can mix them all together to make one great big deck if you’re feeling confident. I’ll only be reviewing the General Interest collection, but you can pick up Science and Discoveries, Inventions, Music and Cinema, Historical Events and the newest one to the collection Star Wars. There are 110 cards in the deck. 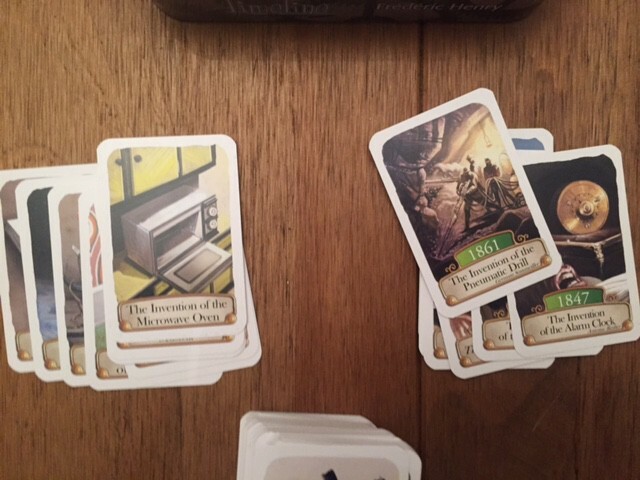 In the General Interest deck that we played the cards are illustrated beautifully with images of major and minor historical events. Things like the introduction of the fork, the first domestication of cats to the more important world events like the first exploration of Mars or the discovery of the remains of titanic. You can be forgiven for having no idea when any of these events take place. On the reverse of the card is the same illustration, but with the year the event took place. You deal out 4 cards to each player (I recommend 4 players, but you can play with less) with the date side face down. You then put all but one of the remaining cards to the side again face down. The one card that isn’t in the deck is put face up in the centre of your play area so the year of the event is on display. Now the idea is to simply get rid of your 4 cards. Sounds simple right? Say that the card with the date up is the invention of the dishwasher and the year is 1862 (I can’t recall off the top of my head, but yes apparently the first dishwasher was around in the 1800s which threw us all off the trail). You need to put one of you cards down that you believe happened before or after that event in the timeline. So in your 4 cards you may have when was the coliseum built which you’d hazard a guess was way before the 1800’s. So you’d put the card still face down before the dishwasher card. With all opposing eyes on you, you flip your card over to reveal the date and either sigh with relief that you were right then play it off like you were always confident or get mocked by the other players for not knowing that the coliseum was obviously built after 1862? The games can be over reasonably quickly depending on your general knowledge of historical events, or if you’re just incredibly lucky and make correct guesses, But that said you can get games that take longer than the average 15 minutes. 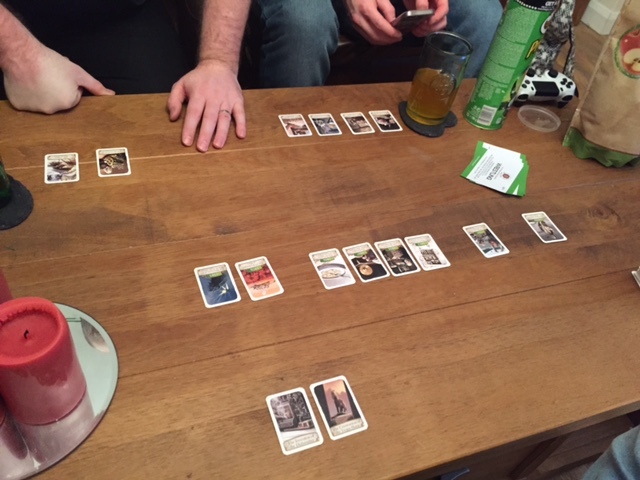 Each game I’ve played so far has taken way over that with some instances our timeline has had to be broken down into 4 different lines to fit on the table. While it’s not as loud or fast paced as other card games, it’s still entertaining and can bring laughs at the expense of other players being so off the mark with where they believe an event took place in time. Another game that would fill up space in a Christmas stocking, and could make for an entertaining family game over the festive period. Grandparents could potentially have an advantage in some of the categories though given their years of life experience.